It’s become a common cliché that bodyweight athletes don’t have strong legs. Look at the comments on any YouTube clip showcasing advanced calisthenics, and you’re bound to see someone hating on the lack of lower-body development. A number of coaches also insist that it’s impossible to build a strong, powerful lower body without external weights. Balderdash, I say! Bodyweight exercises alone can make you every bit as strong as can barbells and dumbbells. You just need to push yourself and get a little creative. While newcomers need to spend some time honing their bodyweight squats and lunges, it usually doesn’t take long for these basic exercises to max out on their strength benefits. Once this occurs, however, adding weight is not the only solution; you can continue to build strength by simply progressing to more difficult bodyweight exercises, like I discuss in my book Pushing The Limits. Ultimately, I recommend working up to single-leg movements like the pistol squat to get the most out of calisthenics leg training. However, these types of advanced movements may remain out of reach until you’ve built more strength. 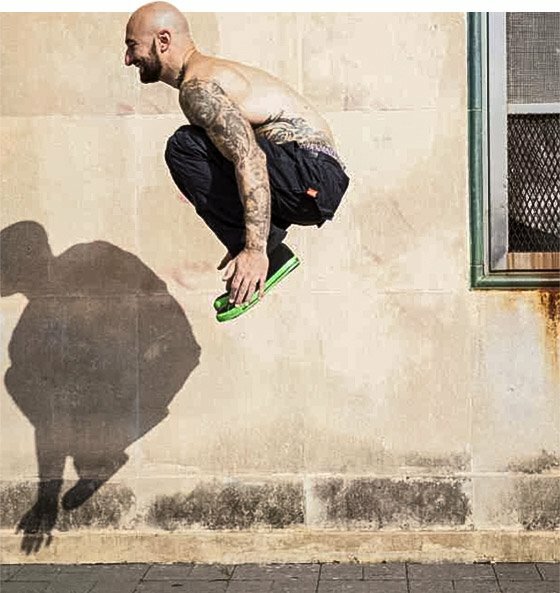 As an intermediate step, jump training can add a challenge to your lower-body workouts without the need for weights or equipment. And even if you’re well-versed in pistol squats, some of these simple exercises may offer you a new challenge and a welcomed change of pace. A jump squat is like a regular bodyweight squat, except instead of simply standing up at the top of your range of motion, you jump as high as you can, lifting your knees toward your chest at the top. You can do them jumping in place or up onto an object. Though your legs obviously do most of the work, jump squats are a full-body exercise, so use your arms to generate momentum. Remember to stay light on your feet and avoid landing with your knees locked. Keep your joints relaxed and do your best to absorb the impact as gently as possible. Try to go directly from one jump into the next, taking advantage of the elasticity of your muscles and their stretch reflex. If you’re not able to do this at first, however, just reset and take a few seconds between reps as needed. Another fun plyometric squat variant, the broad jump is essentially the same as the jump squat except you jump forward, not upward. You still want to lift your legs high as you jump, however; this will help you clear more distance. Leaving your legs dangling isn’t as aerodynamic. You’ll need a lot of space to practice broad jumps; I recommend a park or field. Again, try to go from one rep right into the next, though feel free to take a few seconds between reps if you need to when starting out. Lunges are one of my favorite leg exercises, but like anything else, they need to be progressed once they cease to be a challenge. Start out with a stationary jump lunge by lowering yourself down into a split squat and jumping up at the top, gently landing back into the bottom position with your knees bent. Do several in a row, and then switch legs. When you get comfortable with those, the cycle lunge is a more advanced jump lunge worth trying. It starts out the same as the stationary jump lunge, but once you’re in the air, you’ll have to quickly switch your legs before landing. Continue to alternate legs with each rep, going from one right into the next. Feel free to swing your arms for momentum or keep them at your sides. It might take a little practice to land comfortably without losing your balance. 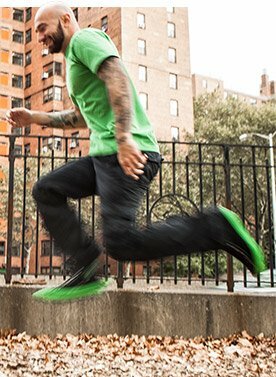 Though often overlooked, running is arguably the most natural and fundamental of all lower-body calisthenics exercises. Though most people associate running with long-distance cardio training, sprinting turns up the intensity to such a degree that the body’s response is more like performing a heavy set of barbell squats than jogging a 10K. Yes, you can actually build strength and muscle through sprinting! Remember that when you sprint, both of your feet are often in the air at the same time, so sprinting is pretty much a form of jump training. You can do sprints for time or for distance, but either way, keep them brief and intense for the most strength benefits. Here’s a simple routine that can be done anytime to help you find your footing in jump training. Perform all exercises consecutively, with 1-2 minutes rest between each set. There is no single strength building method that’s guaranteed to work best for everybody. Weight training will forever have its place in strength and conditioning, but there will always be alternative options to help build athleticism outside of the traditional weight room setting. Bodyweight workouts are often the most practical means of getting a quick but effective workout when you’ve got a busy schedule and/or don’t belong to a gym. Give the workout above a shot. I promise it will leave your quads aching and your hamstrings hammered. Pistol squats pop up all over the place, but that doesn’t make this classic movement any easier. Commit, do the work, and let Al Kavadlo be your guide!